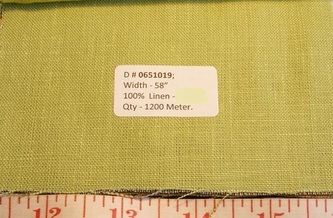 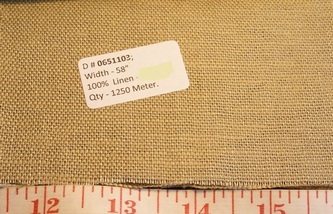 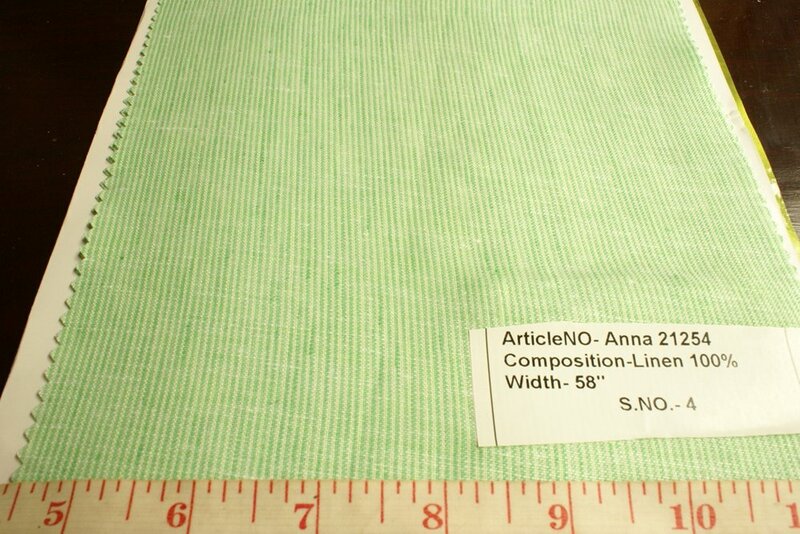 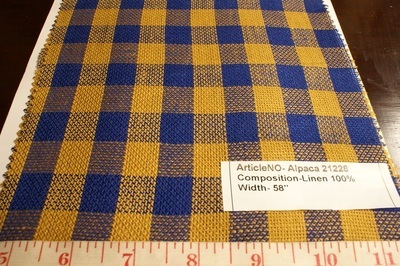 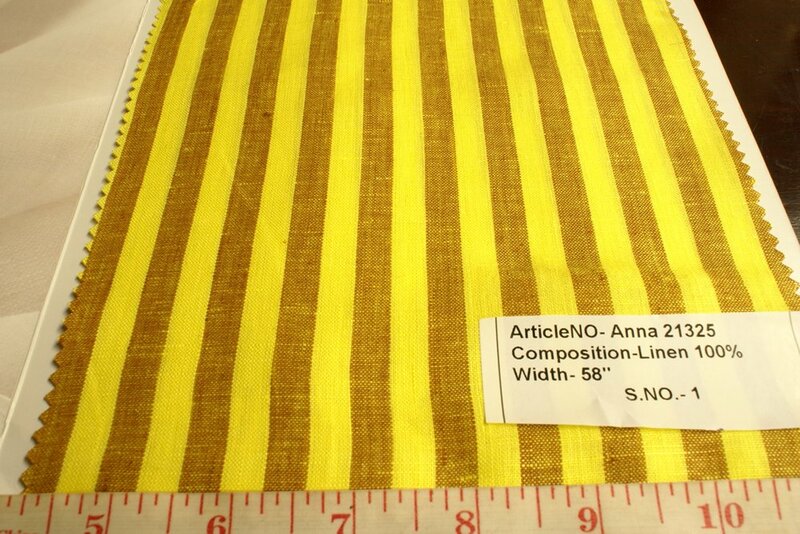 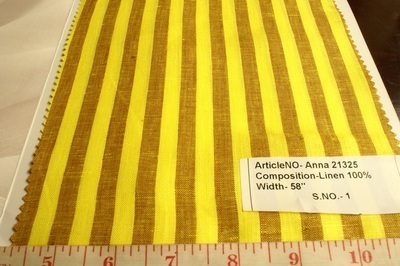 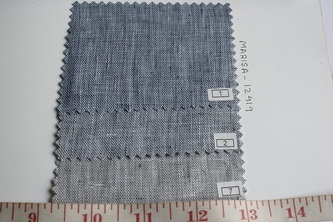 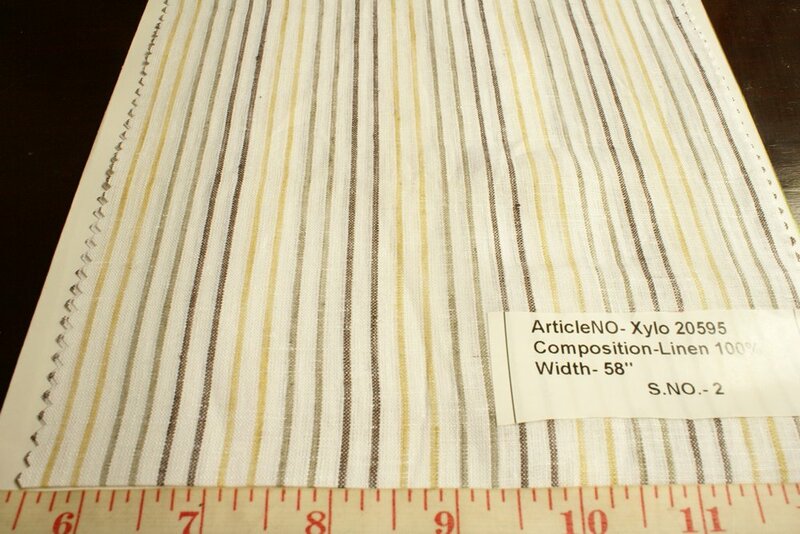 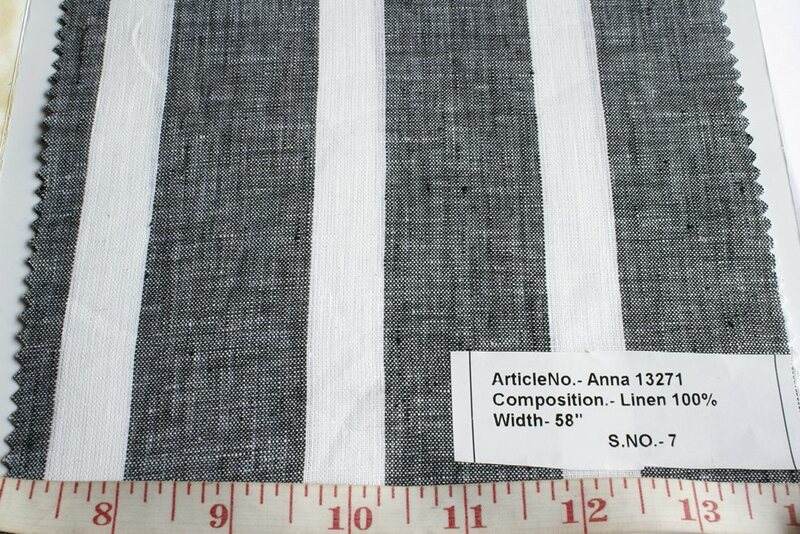 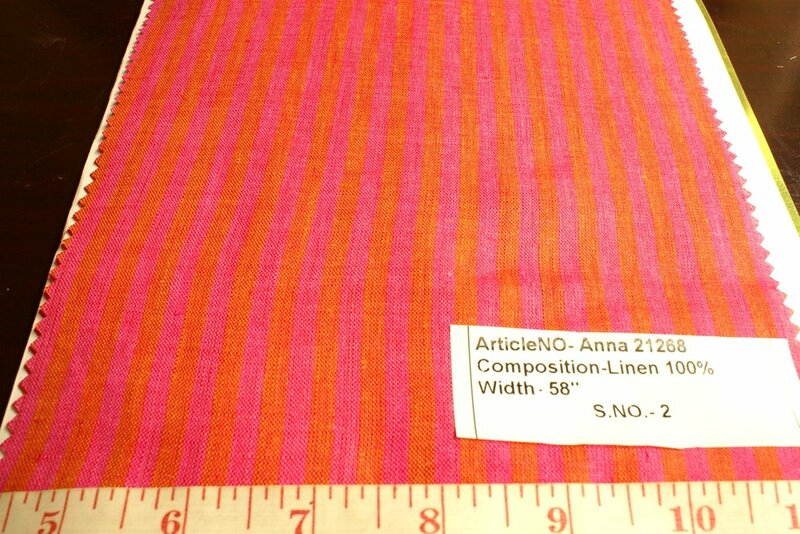 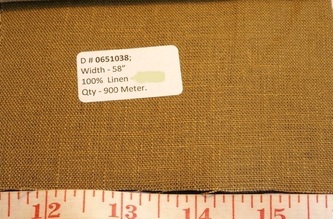 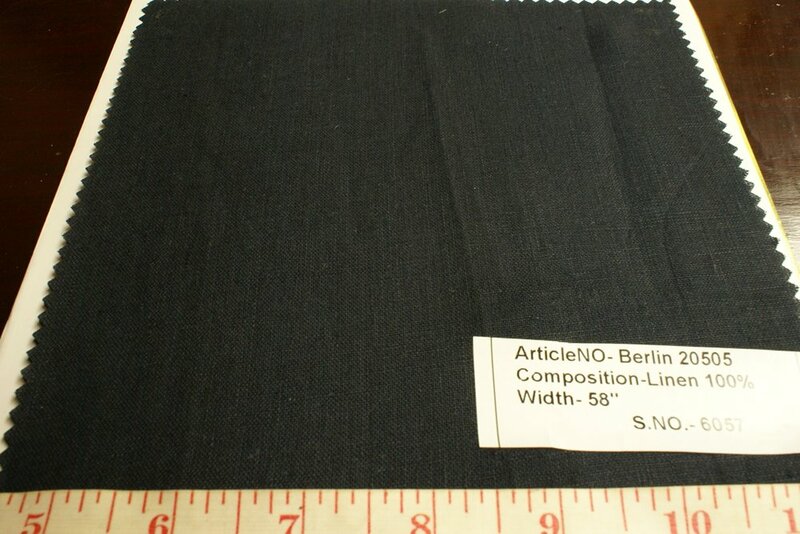 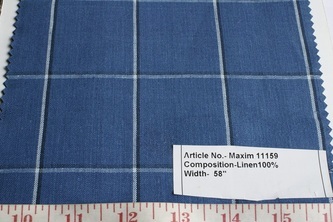 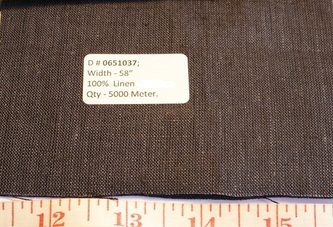 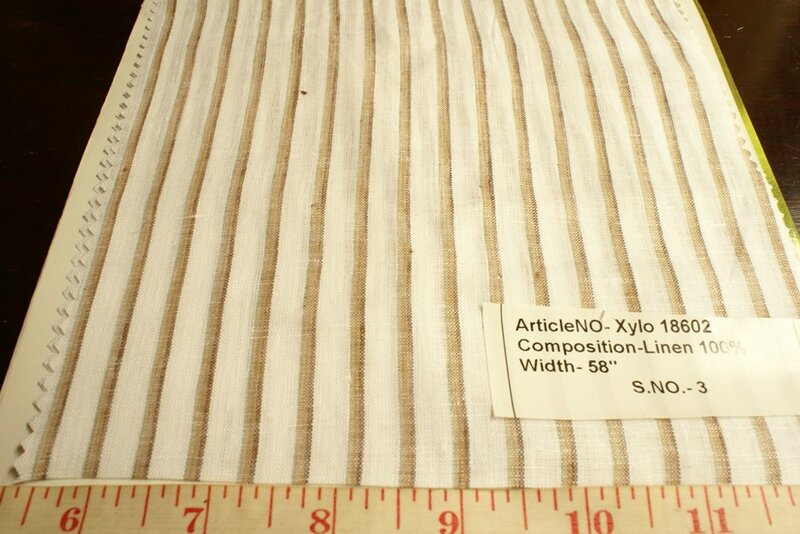 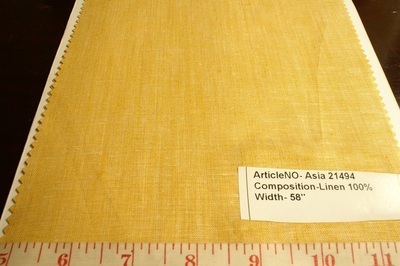 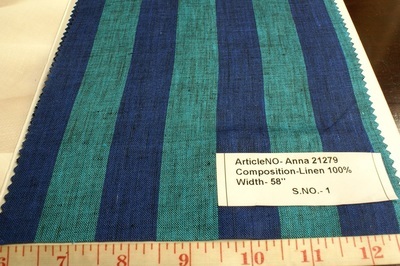 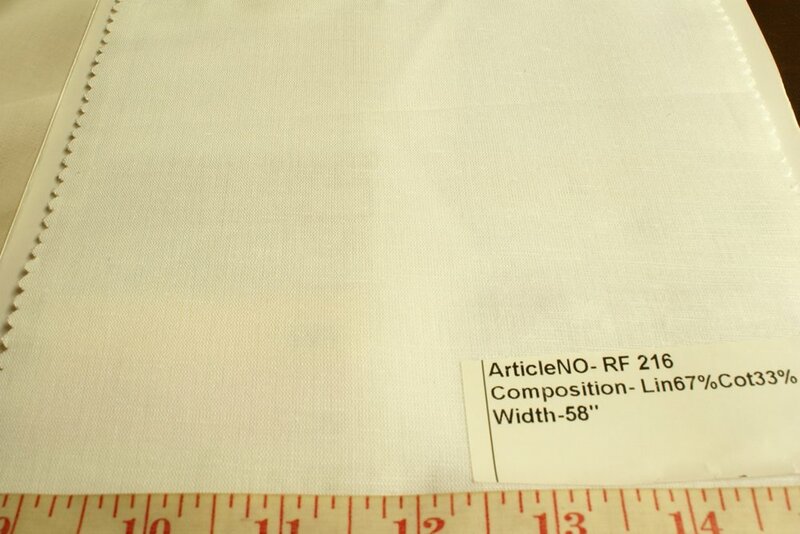 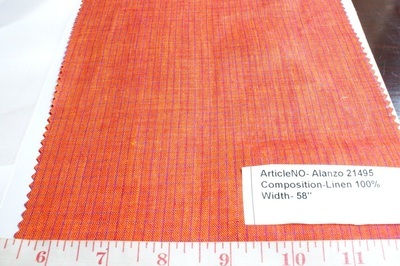 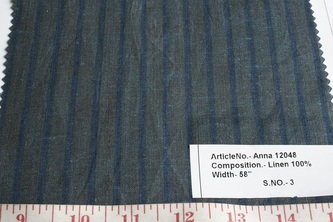 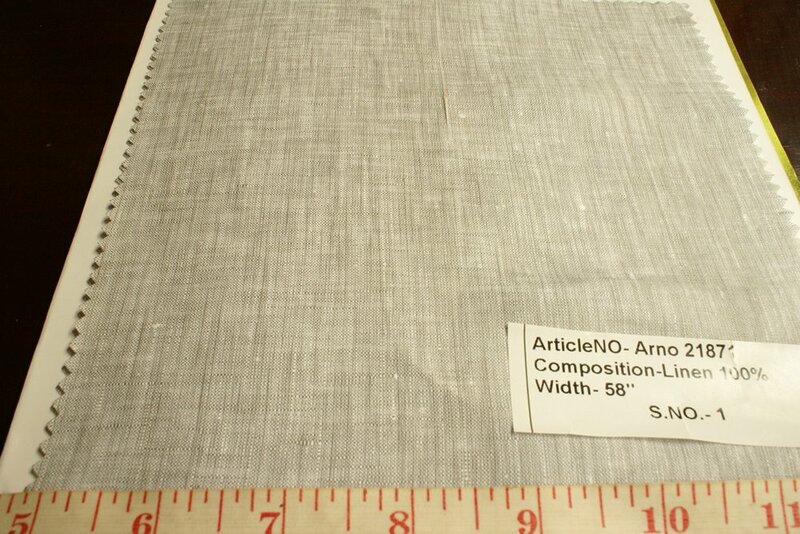 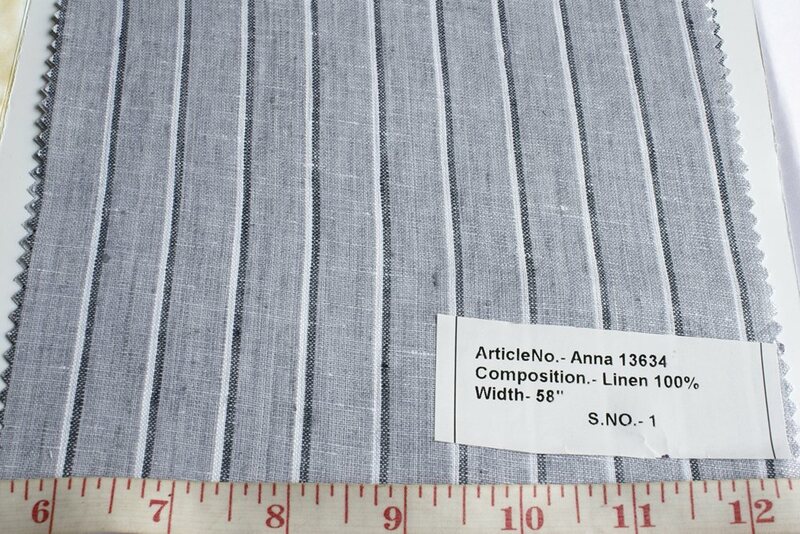 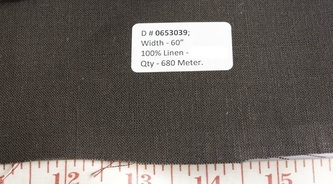 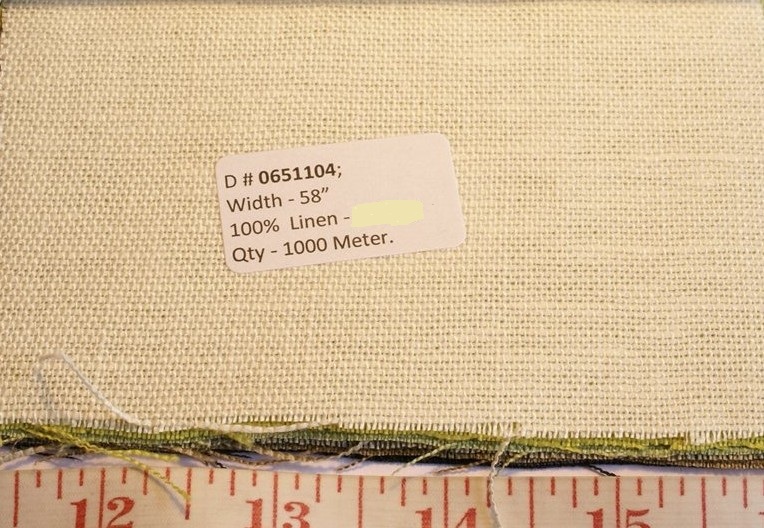 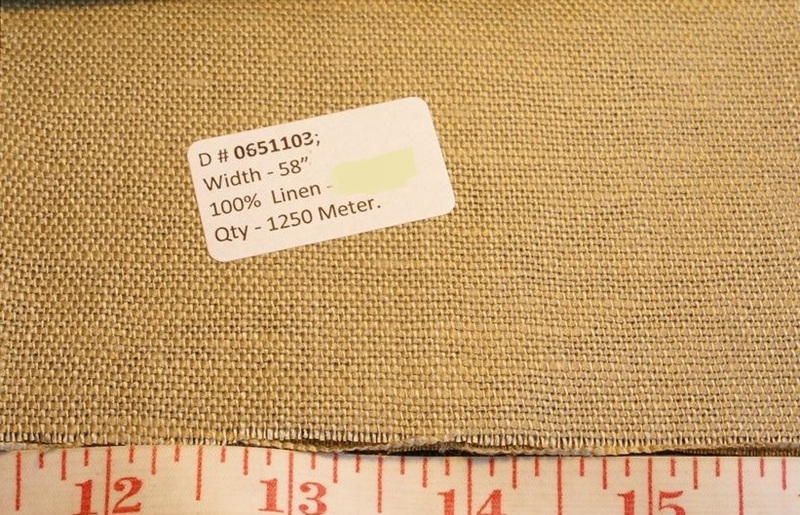 Linen fabric is 100% Flax fiber fabric, made from Flax and is a light to heavy weight woven fabric, with a grainy weave. 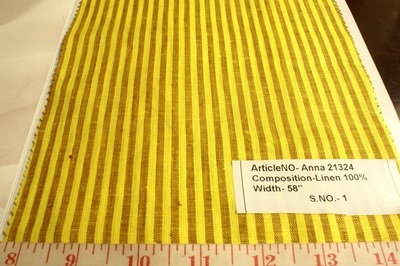 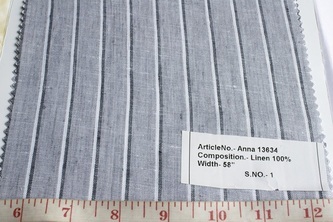 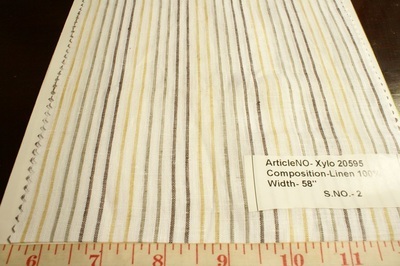 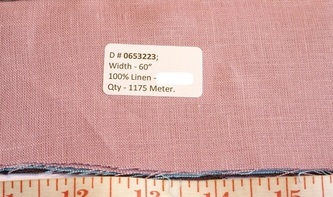 Linen fabric is ideal for shirts and dresses. 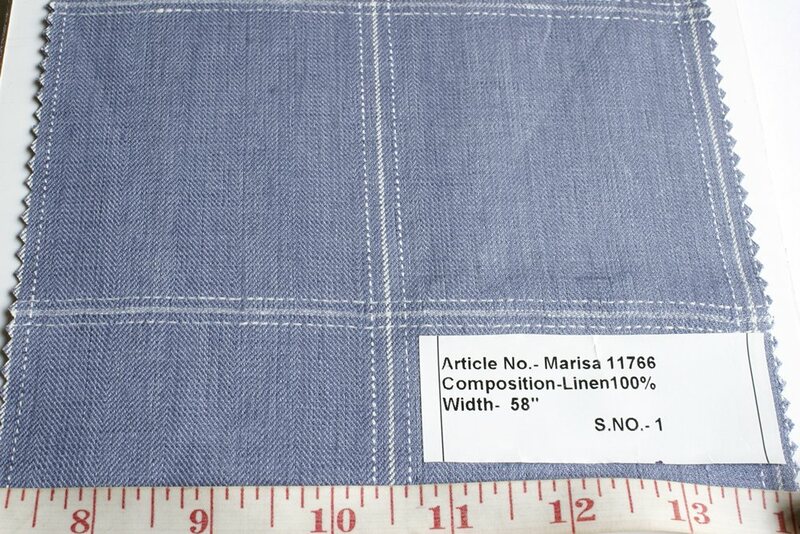 Linen fabric is made from fibers of the Flax plant, and is a summery, cool, absorbent fabric. 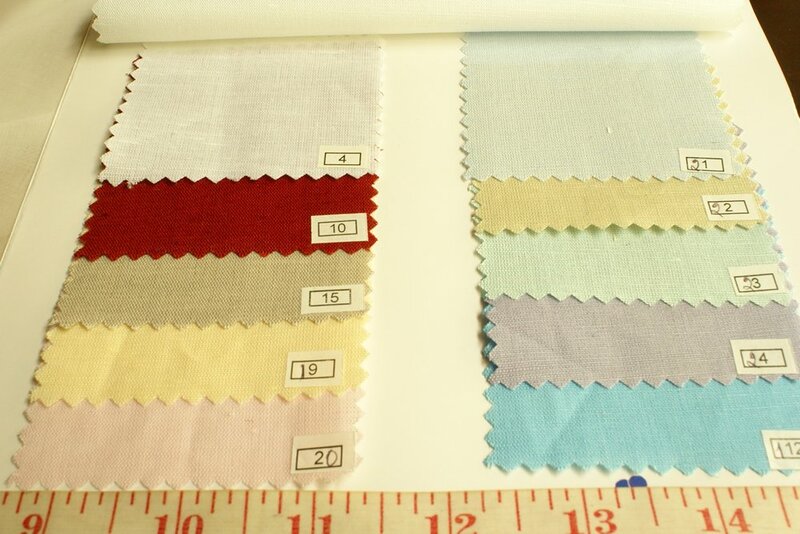 Linen is a natural fabric, made from plant fibers, and is considered skin-friendly. 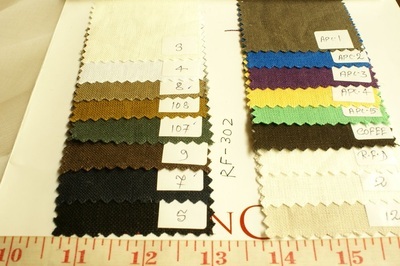 Ideal for shirts, summer suits, pants and dresses, linen is considered a value fabric for menswear and shirting. 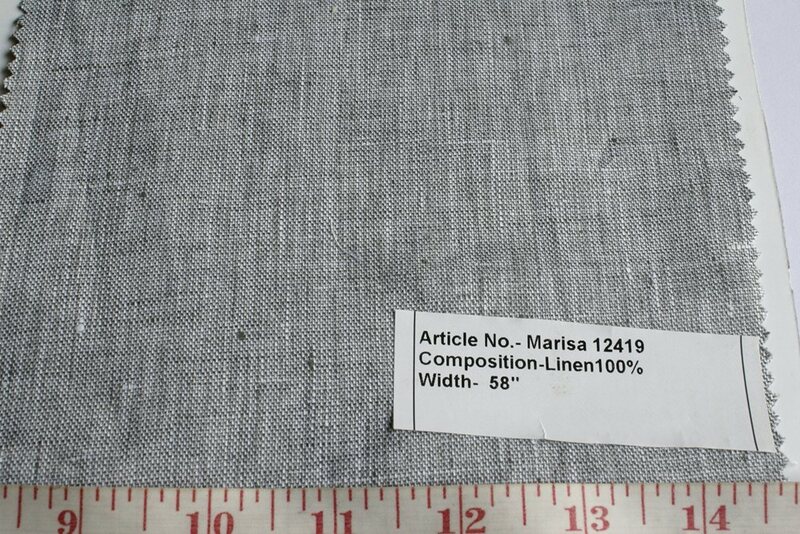 Linen was used centuries ago as currency in Egypt, and for was a revered fabric, known for its elegant feel and properties. 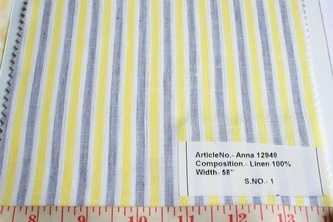 Today, linen is used for shirting and menswear, as well as women's dresses, and is available as solid color, plaid linen, stripe linen and herringbone etc. 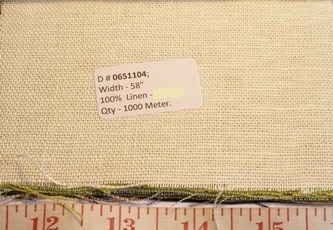 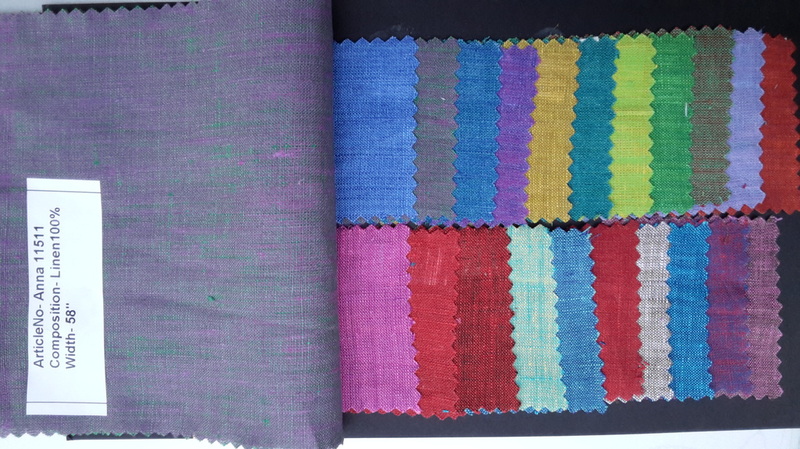 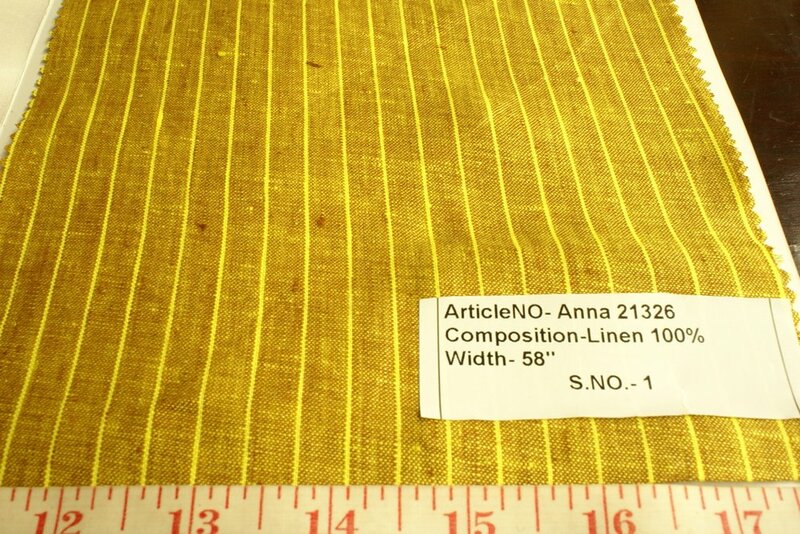 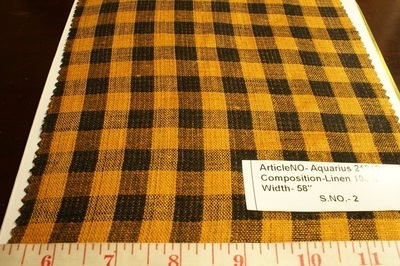 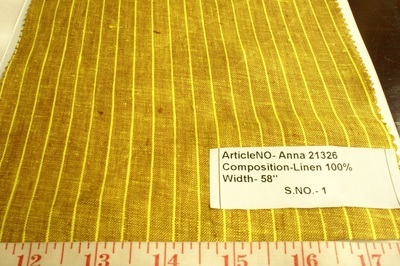 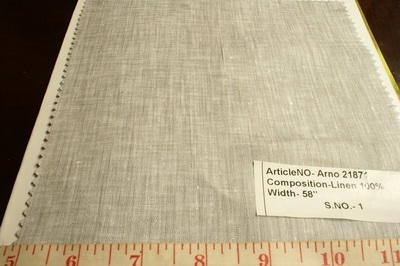 Several fabrics made of cotton and other non-flax fibers are sometimes known as "linen", due to the weave being of the same grainy loose texture, and the same handfeel. 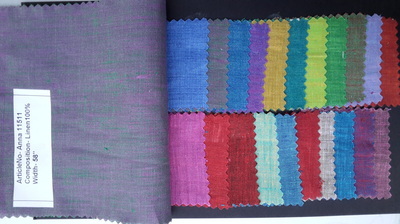 Blends of cotton and linen are also available as cotton-linen. 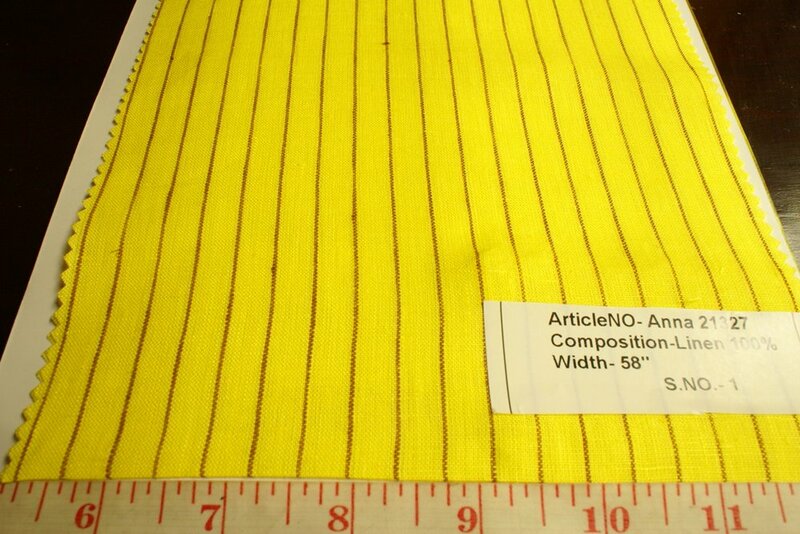 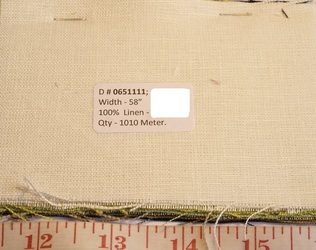 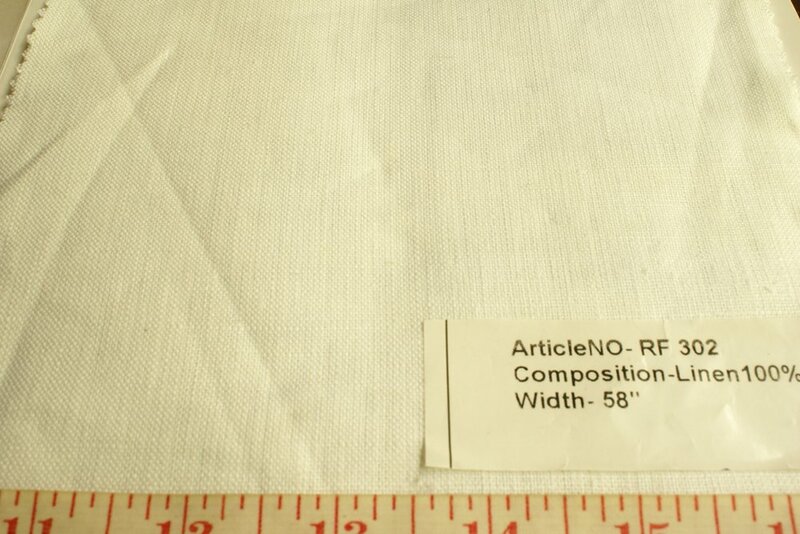 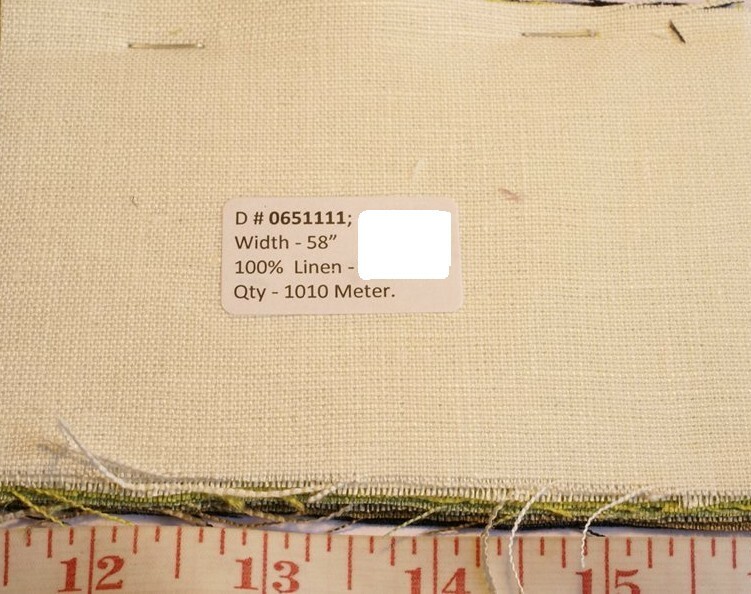 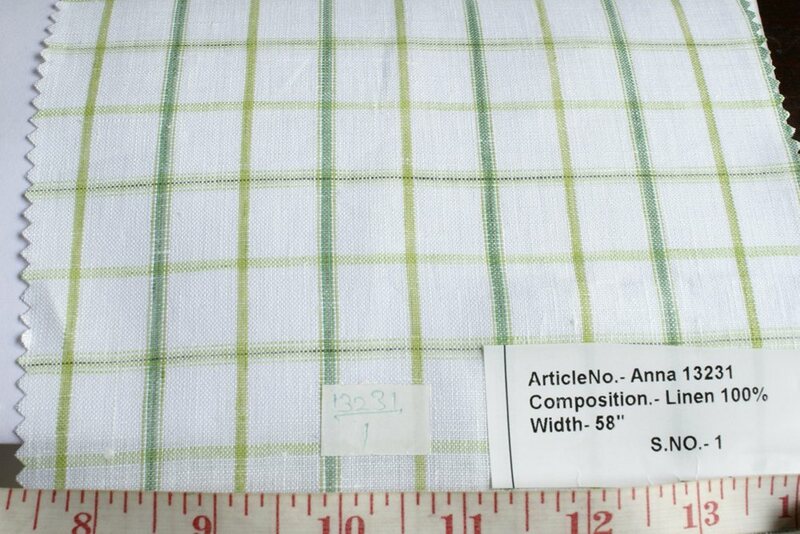 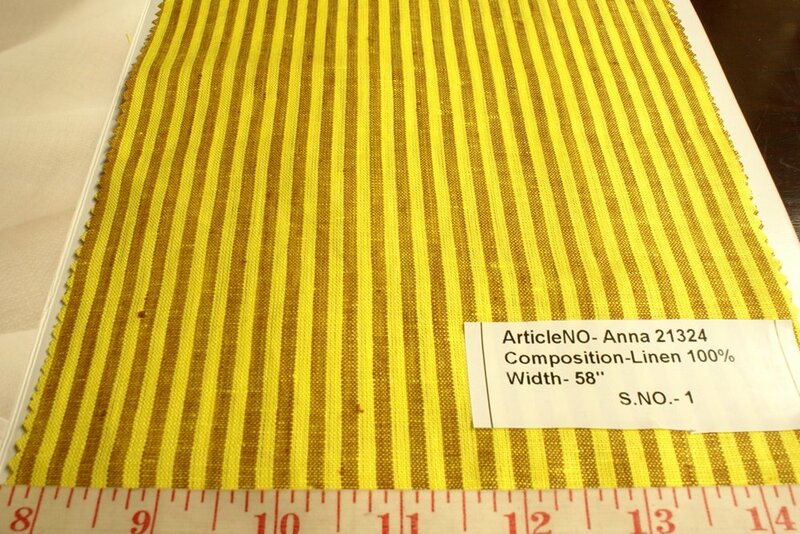 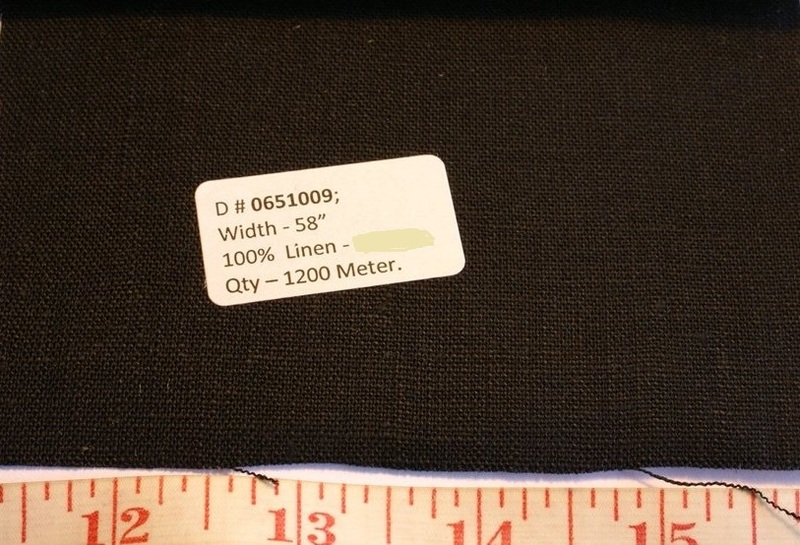 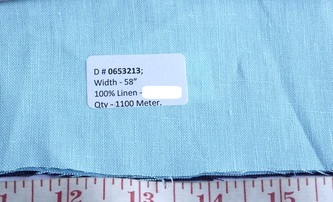 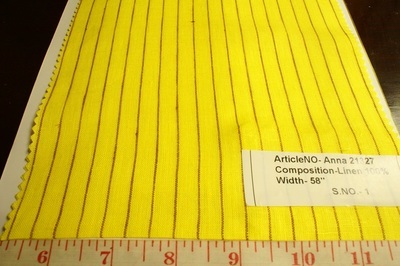 These are typically 50-50 cotton linen, or 60-40 cotton-linen. 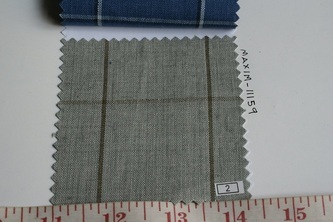 Linen fabric feels cool and smooth. 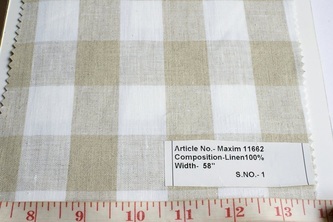 The fabric does crease though, and that is a sign of genuine pure linen, and something that would not be present in cotton-linen as such. 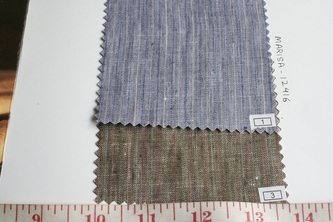 Linen fabrics have a high natural sheen. 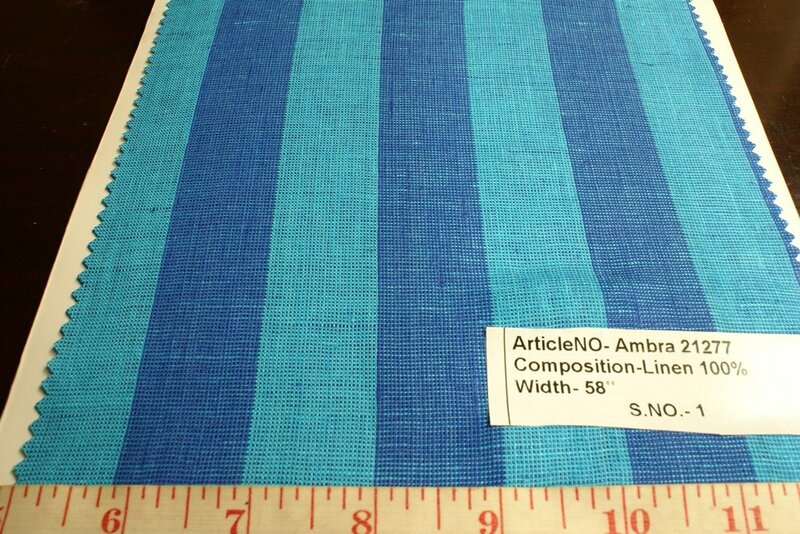 It is a very strong fabric without any stretch to it. 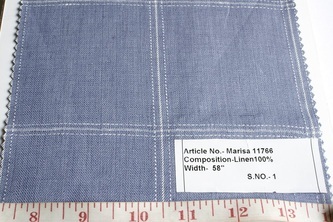 Linen is a trend that has resurfaced in today's menswear and womenswear. 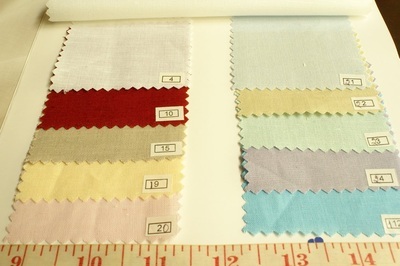 Linen Chambray fabrics available in a myriad of colors. 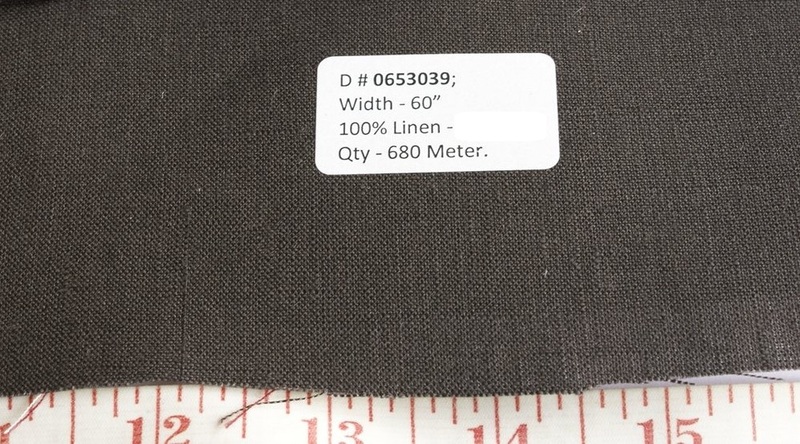 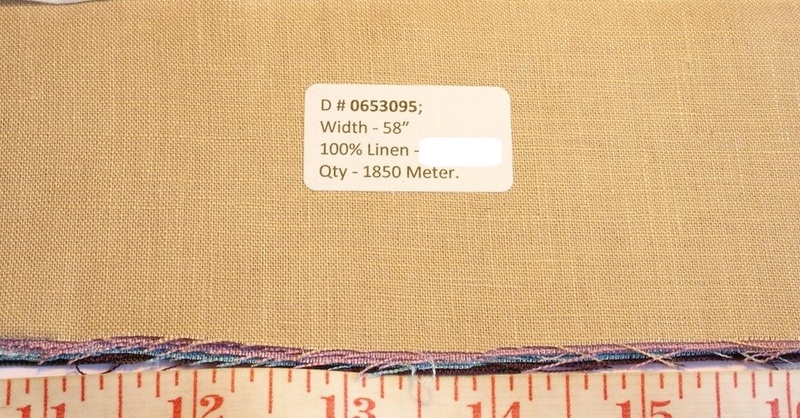 Always in stock.These linen fabric are made from 100% Flax fibers, and are of Belgian and French origin, which are some of the finest quality for Linen fabrics. 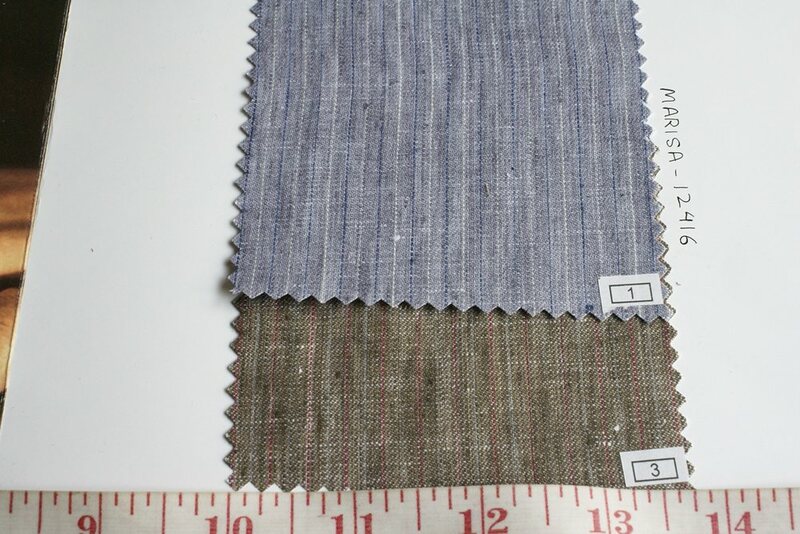 Our linen chambray fabrics are woven with color dyed and white threads alternating each other, or some with 2 color threads alternating each other. Linen chambray is a must-have summer fabric, which is breathable, cooling and soothing in its appearance and overall feel. 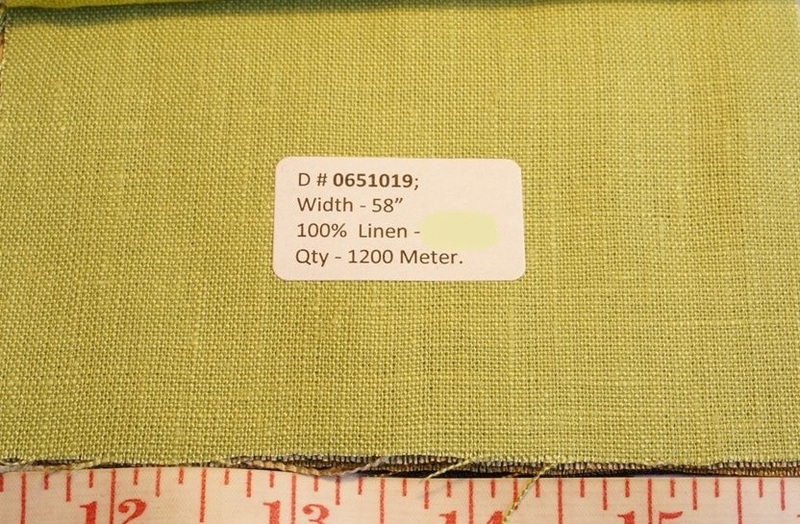 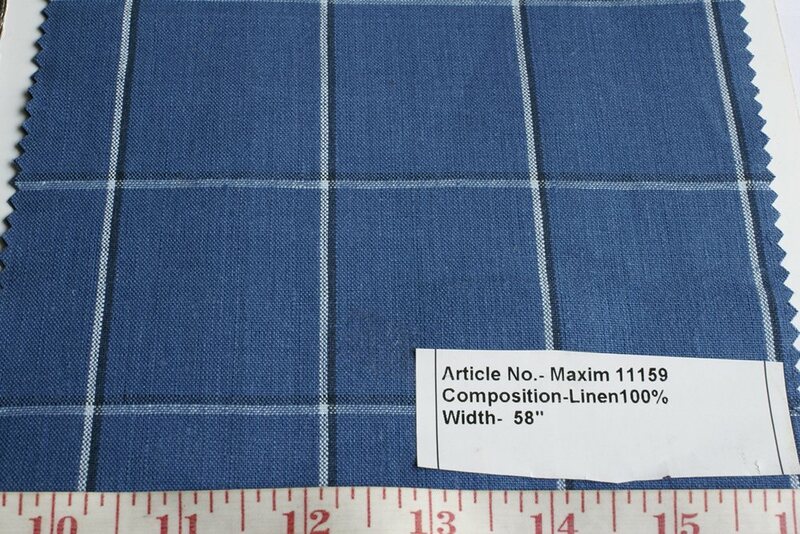 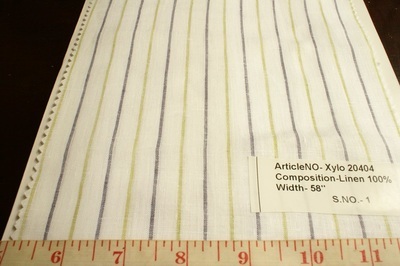 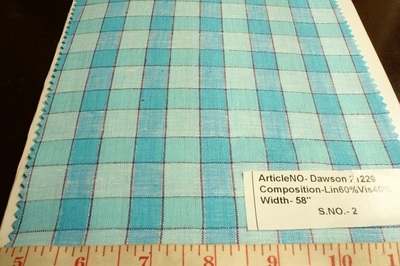 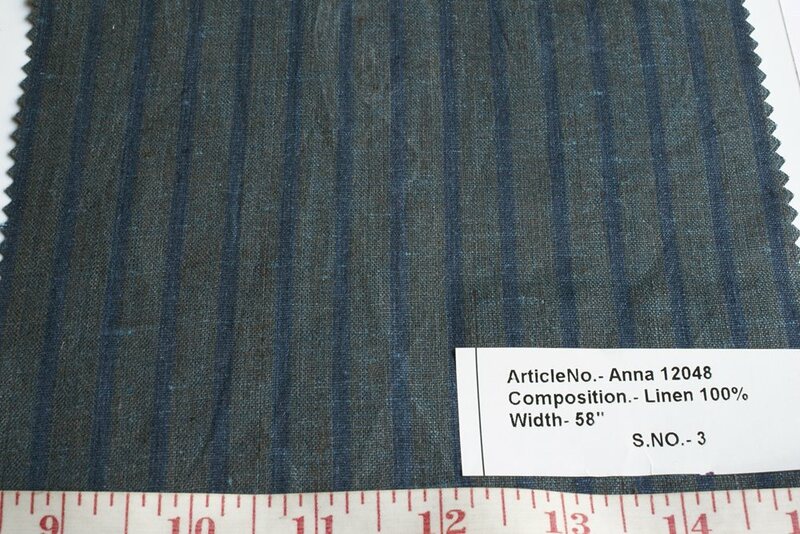 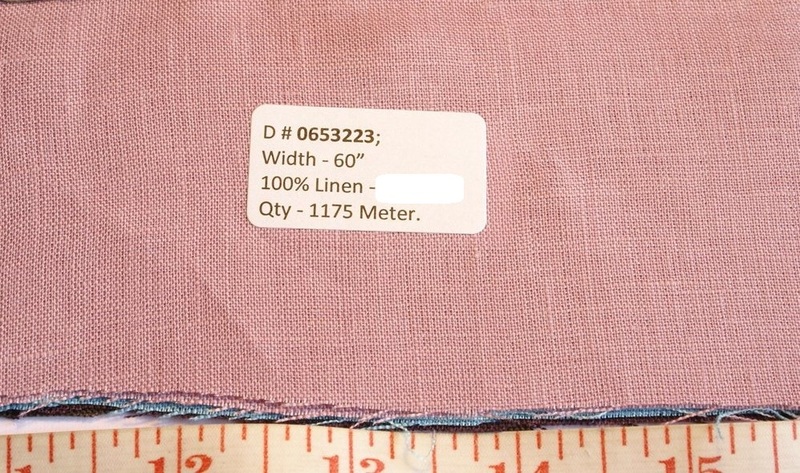 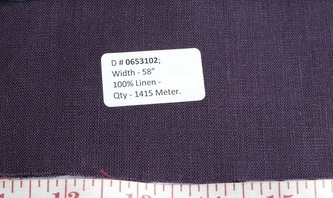 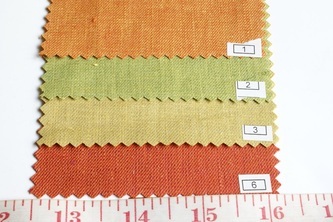 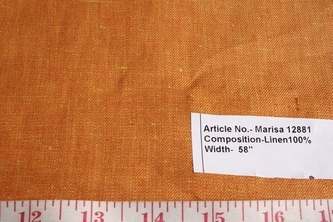 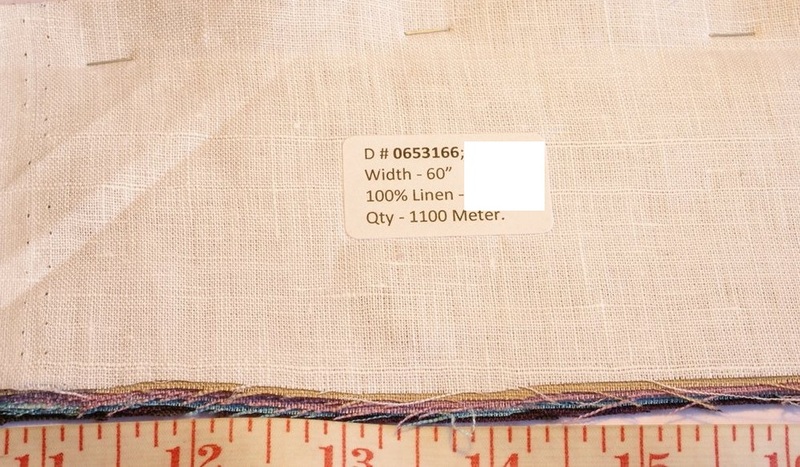 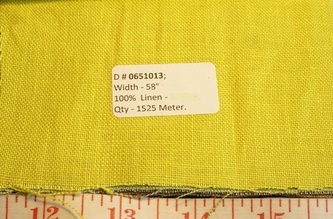 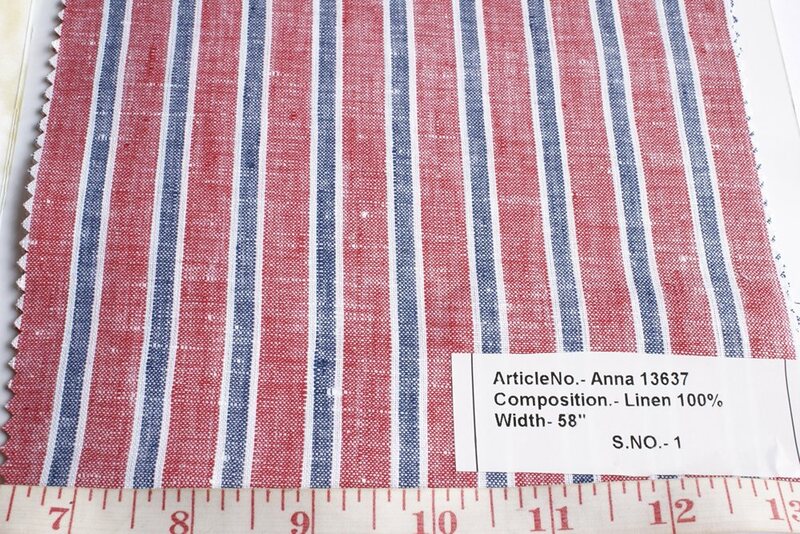 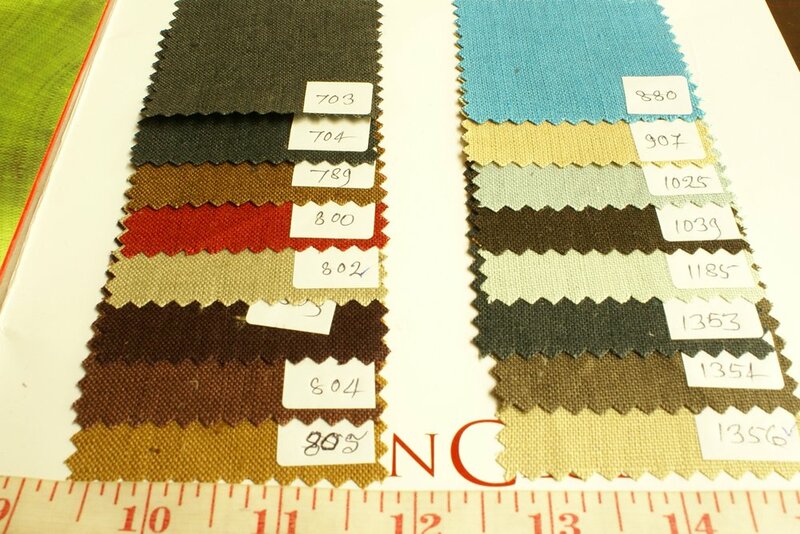 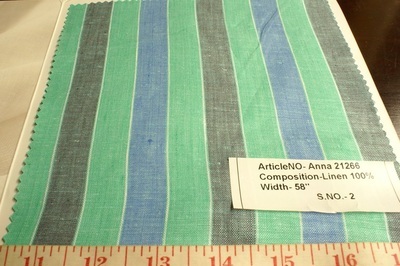 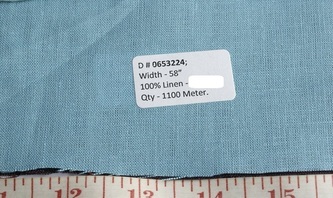 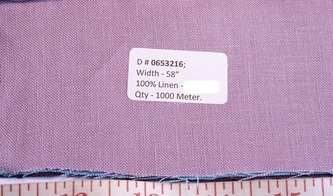 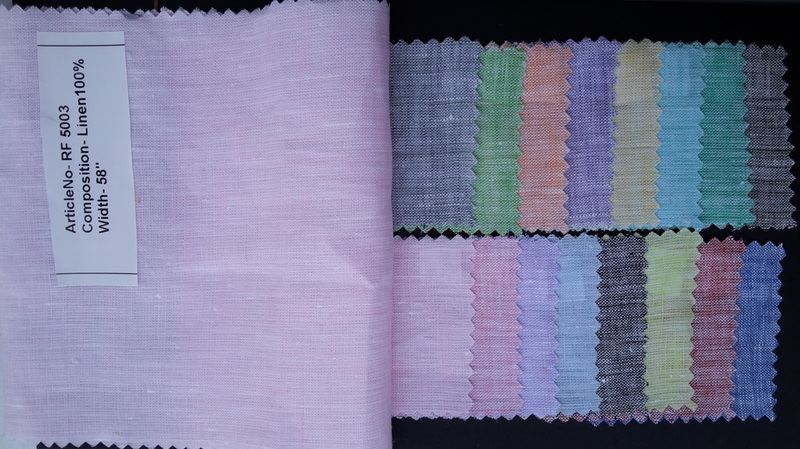 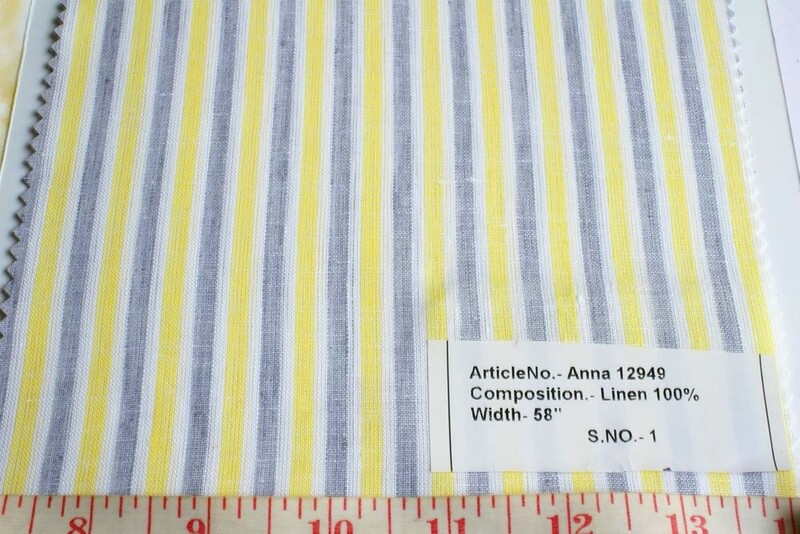 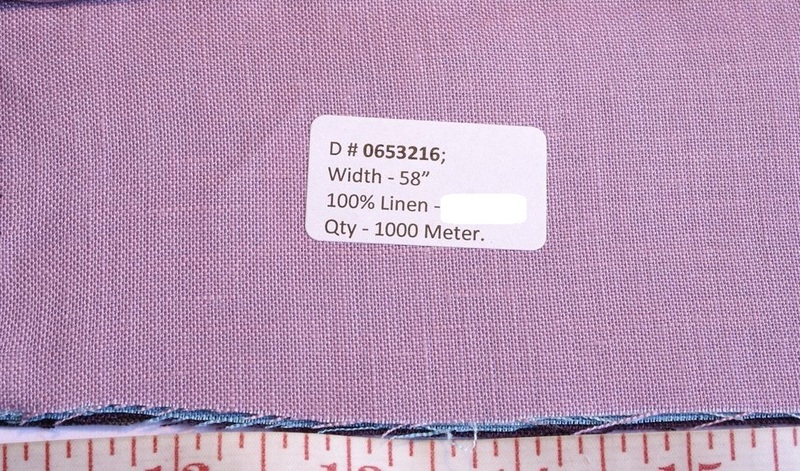 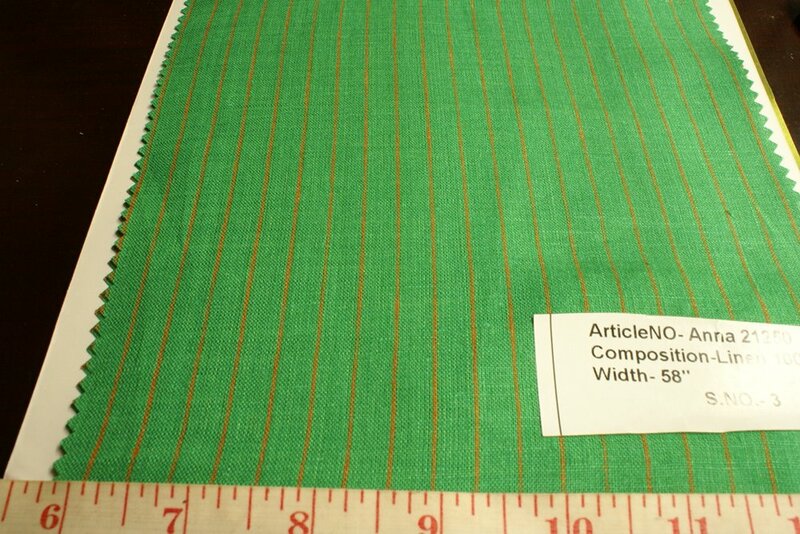 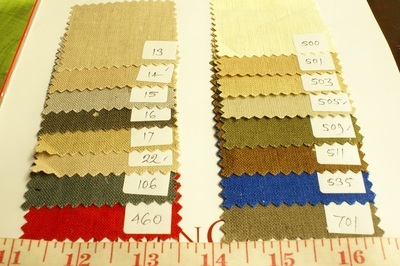 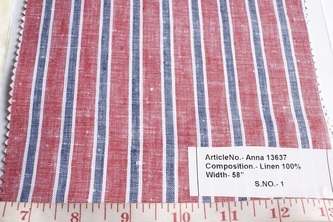 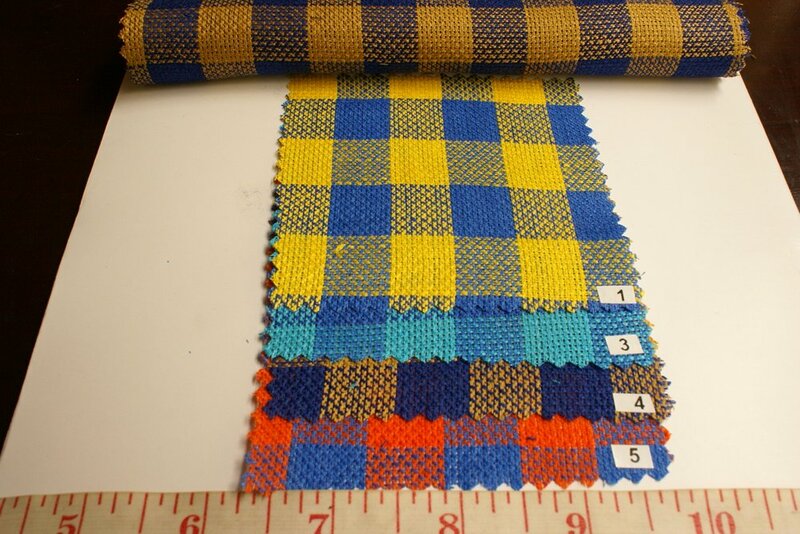 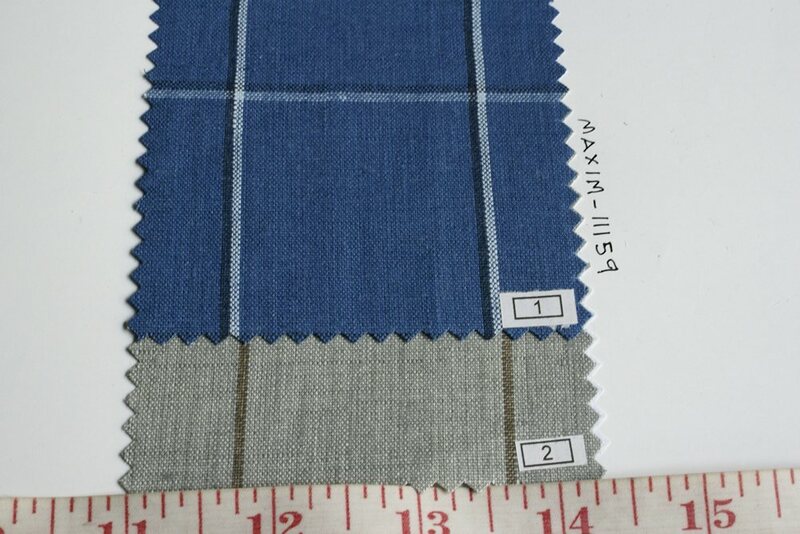 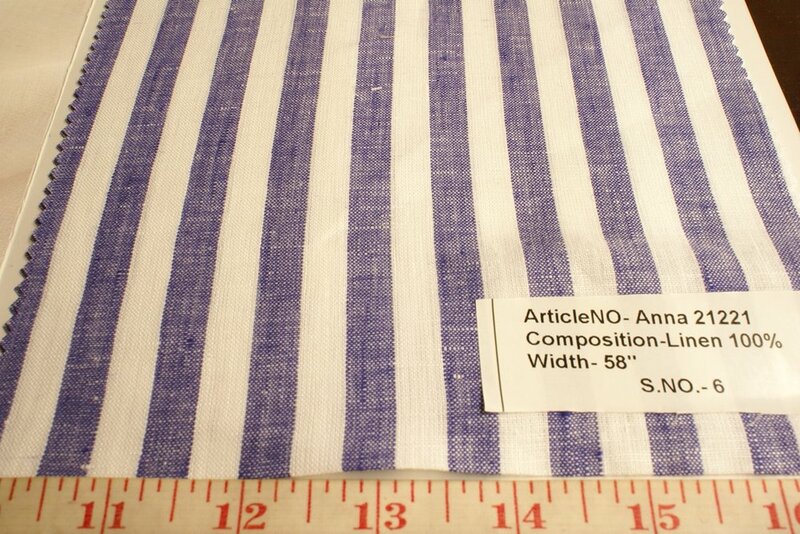 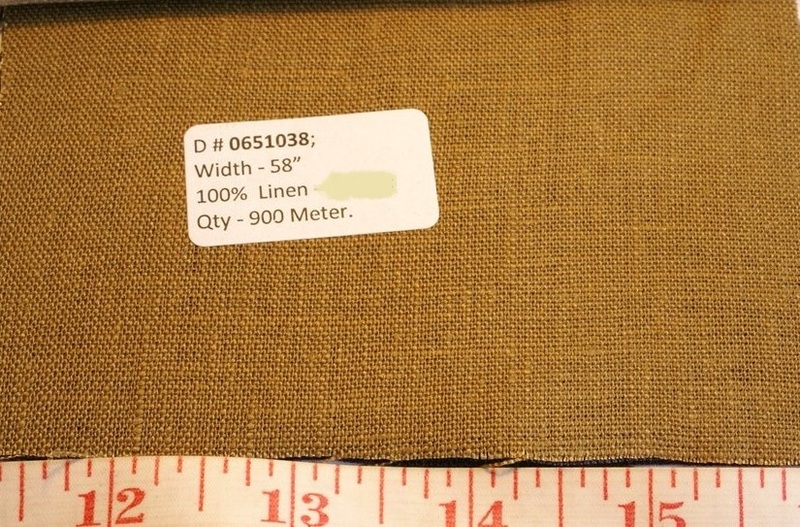 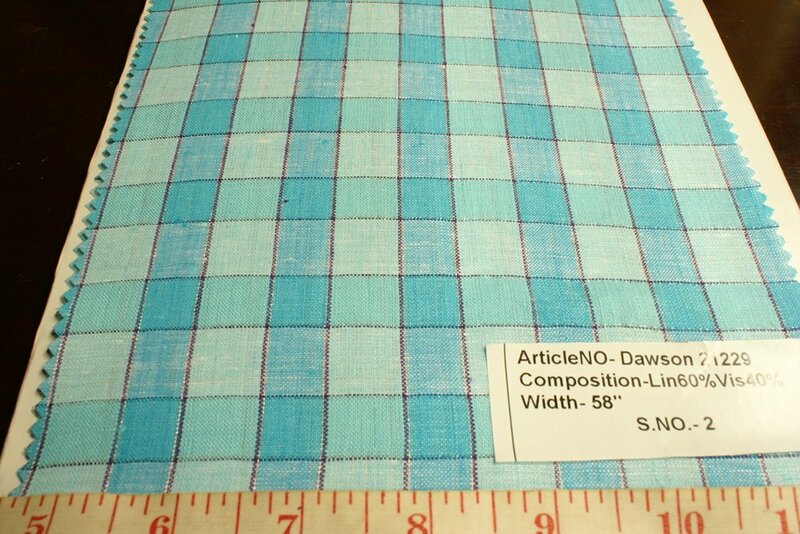 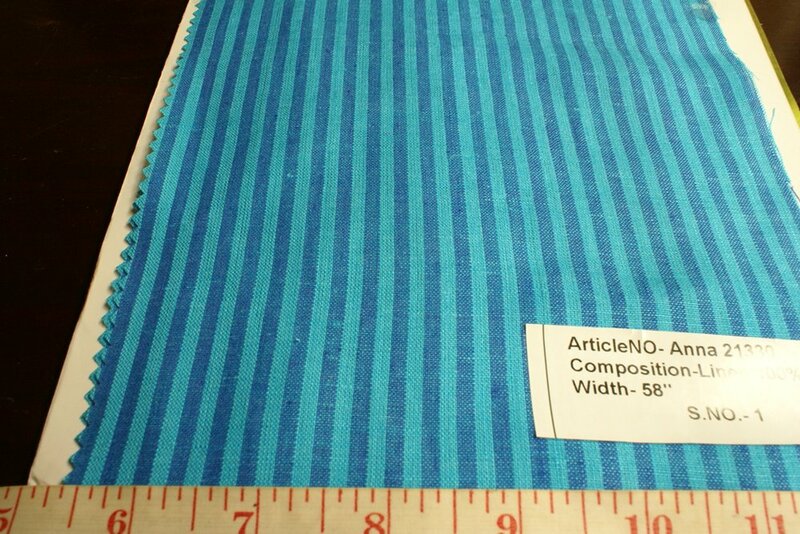 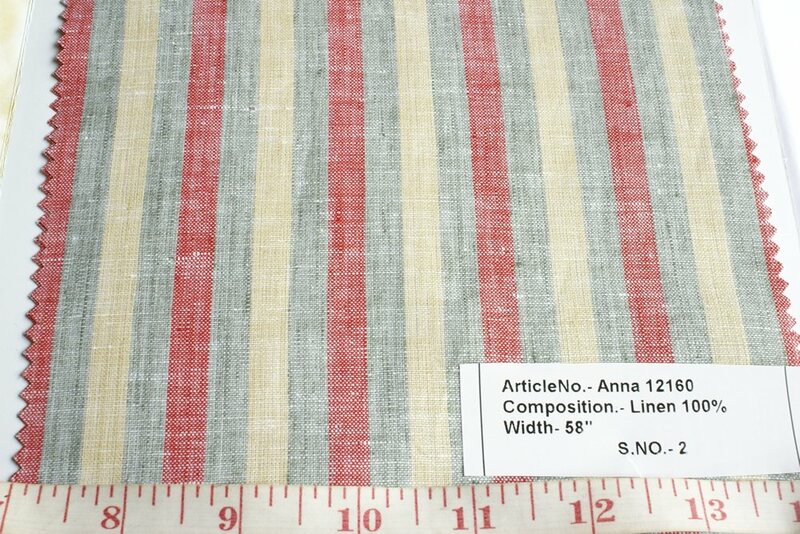 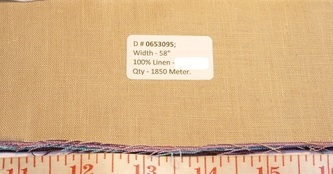 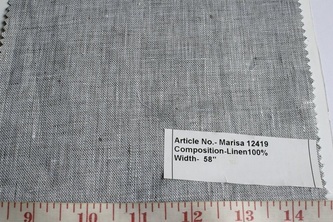 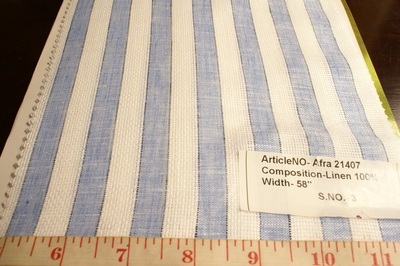 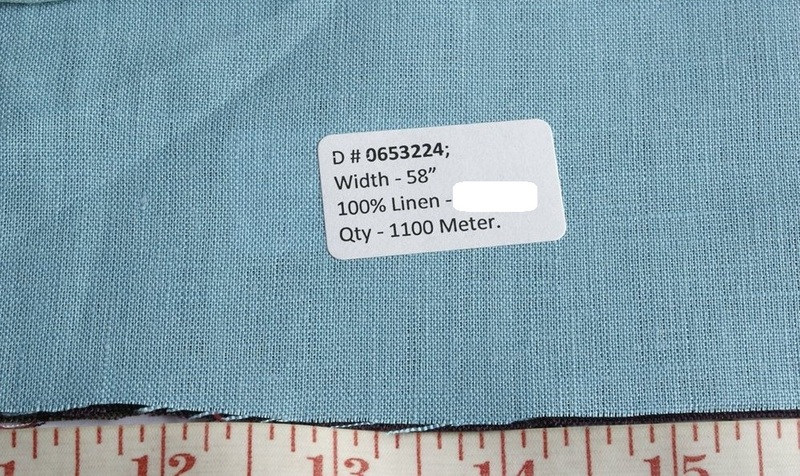 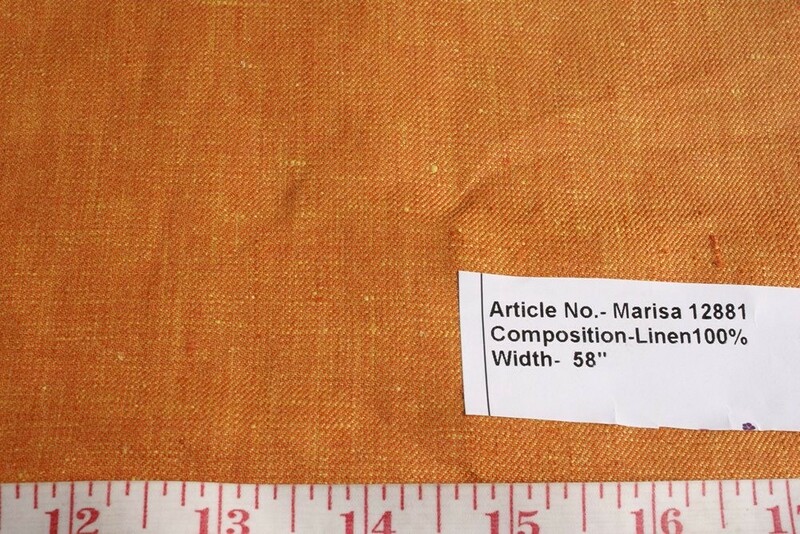 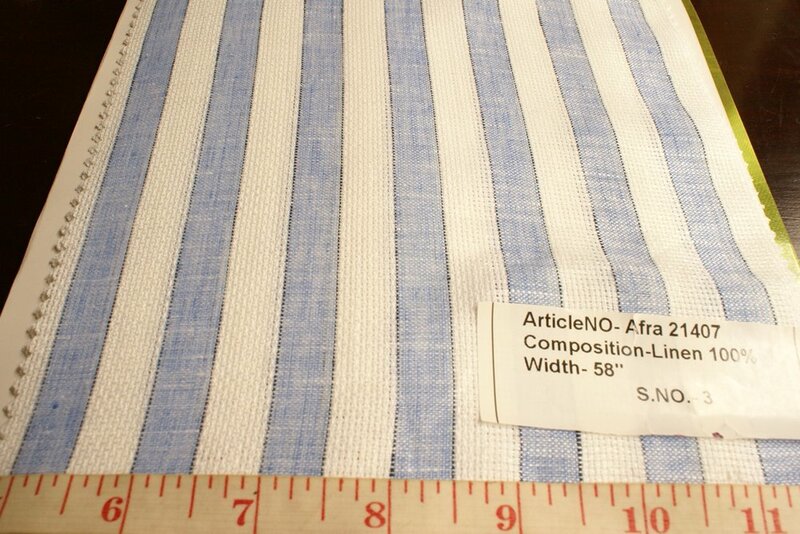 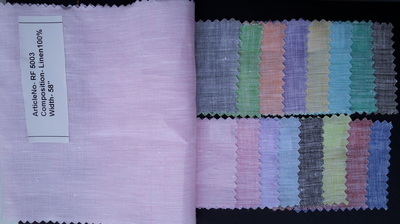 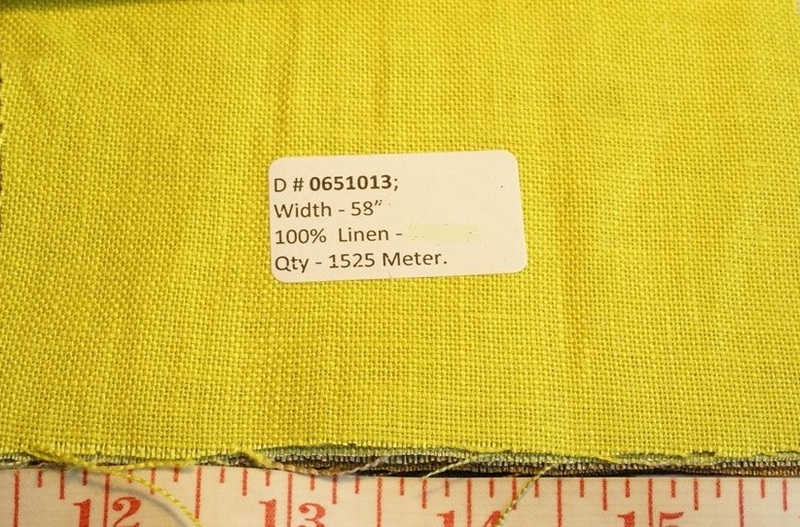 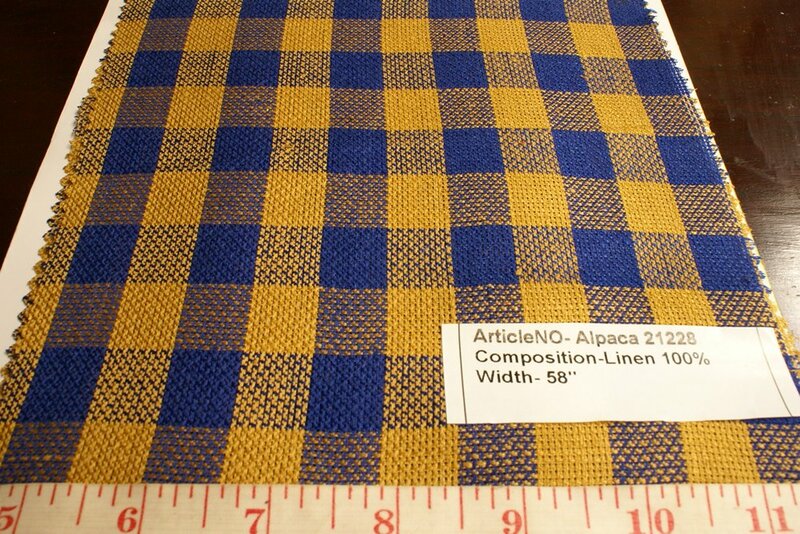 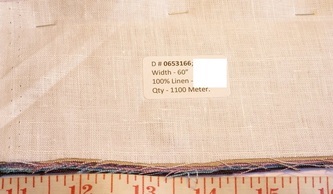 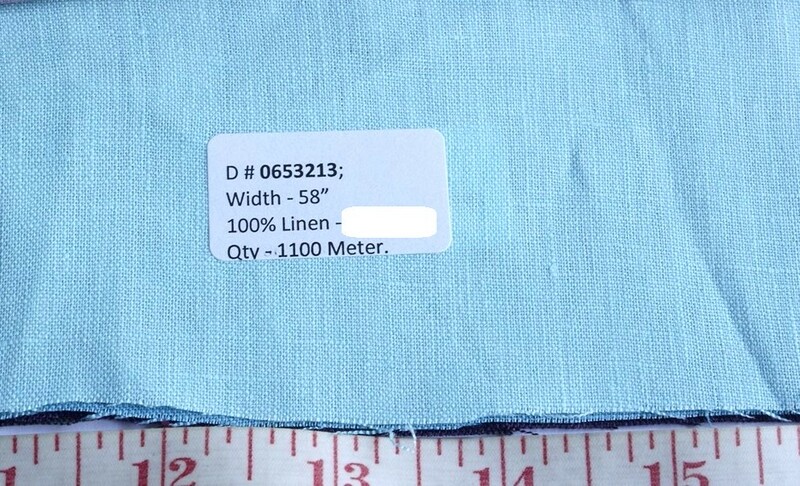 Our linen chambray fabric is availabel in blues, reds, yellows, greens, pinks, orange, and white colors.